"Lord Nityananda, when passing on the street, saw a crowd of people howling at some incident, and on inquiry it was found that there were two rascals of the then name Jagai and Madhai. They were always disturbing people in drunken condition. Nityananda Prabhu thought it wise that these two brothers may be delivered so that Lord Chaitanya's mercy could be well known all over the world. When Lord Nityananda approached them He was immediately hurt by violent attack. On this incidence Lord Chaitanya became very angry and He called for His Sudarsan Chakra to kill these debauchees. Lord Nityananda then implored Lord Chaitanya not to kill Jagai and Madhai but to save them. By this time Jagai and Madhai came to their senses and immediately they surrendered unto both the Lords and were delivered by the mercy of Lord Nityananda. So Lord Nityananda or Baladev is the original Spiritual Master, and such pure devotee sometimes takes the risk of life in order to reclaim a person who might have otherwise been rejected by the Lord. 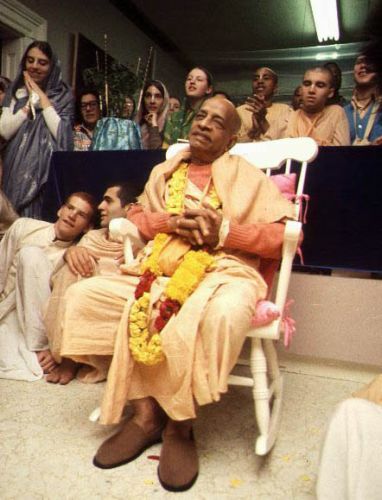 The devotee knows that the Lord wants all the fallen souls to come back to Home, and therefore the devotee always tries to induce the conditioned souls to take to Krishna Consciousness by various means. Therefore the conclusion is that a devotee is more kind than the Lord Himself."